By acquiring Mitsui Life, Nippon Life is positioning itself as Japan's biggest earner of insurance premium income. 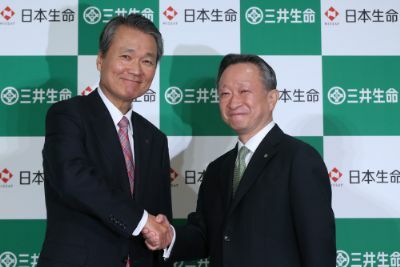 Nippon Life President Yoshinobu Tsutsui, left, shakes hands with Mitsui Life President Shinya Arisue following a joint news conference in Tokyo on Friday. (Bloomberg) — Nippon Life Insurance Co., Japan’s biggest life insurer by assets, and Mitsui LifeInsurance Co. said they have reached an agreement to merge as the nation’s insurance companies seek ways to counter slowing growth. Nippon Life and Mitsui Life plan to finalize the deal by early November and complete the merger by March, according to a joint statement Friday. Nippon Life plans to start a tender offer for Mitsui Life’s shares as early as October and eventually hold 85 percent of the rival, according to the statement. Details of the tender offer were not given. Neither company is publicly traded. The acquisition is in contrast with a recent spate of multibillion-dollar takeovers abroad by Japanese insurers as the country’s aging population limits growth prospects at home. Excluding the Nippon Lifedeal, Japanese insurers have announced $24.5 billion of acquisitions this year, compared with $6.2 billion a year earlier, according to data compiled by Bloomberg. By acquiring Mitsui Life, Nippon Life is positioning itself as the country’s biggest earner of insurance premium income, ahead of Dai-ichi LifeInsurance Co. There have been $92 billion of insurance acquisitions announced globally this year, up from $33.9 billion the same period in 2014, the data show. The companies also said in the joint statement that they have agreed not to change the trade name and brand of Mitsui Life. Earlier this week, MS&AD Insurance Group Holdings Inc. said it agreed to buy Lloyd’s of London insurer Amlin Plc for about 3.47 billion pounds ($5.4 billion) in its biggest acquisition. Last month, Sumitomo Life Insurance Co. agreed to buy Symetra Financial Corp. for about $3.8 billion. In July, Meiji Yasuda Life Insurance Co. announced the acquisition of StanCorp Financial Group Inc. for about $5 billion. Tokio Marine Holdings Inc. in June said it agreed to purchase HCC Insurance Holdings Inc. in the U.S. for about $7.5 billion in the biggest acquisition by a Japanese insurer. Dai-ichi Life earned 5.43 trillion yen from premiums in the year ended March. That compares with Nippon Life’s 5.37 trillion yen of premiums and Mitsui Life’s 545 billion yen during the same period. With origins dating back to 1914, Tokyo-based Mitsui Life sells casualty insurance, group pension plans and annuities. It has 7.4 trillion yen in assets and more than 10,000 employees, according to its website. Nippon Life plans to spend as much as 500 billion yen on acquisitions including overseas insurers and asset managers, according to a three-year business plan released in March. Previously, its strategy involved taking minority stakes in companies such as AIA Group Ltd. in Hong Kong, Indonesia’s Sequis Life and Reliance Group in India.